My last article gave an overview of recent Korg synthesis products. Here I will look in detail at the Korg Volca Sample, illustrating features of note, providing helpful resources, and so on. The Volca Sample has notable improvements compared to earlier Volca units. It has stereo output (with pan automation), something I consider rather essential. It also permits step recording, which makes pattern entry a whole lot easier. There's a song mode that enables pattern chaining. You get 6 songs, each of which can contain up to 16 chained sequences. With only 10 stored sequences in total, this is still not a robust way to develop a set of music, but it's a welcome improvement. A major shortcoming is when playing a Song, most of the pattern editing is locked. So you cannot "perform" a Song in the same way you can an individual sequence. For the first time on a Volca there's a swing control, so your beats can be given a degree of "human" feel. Unfortunately, this offset is not transmitted through the sync. Also, it's a global setting, not stored with your patterns. Finally, there's a reverb effect built in, which can be assigned per part, although the amount of reverb is global setting. Speaking of sync, if you use a mono 3.5mm cable you get beat synchronisation between different Volca units. Use a stereo cable to get transport control as well. Now, if you start the sequencer on the master Volca, the slaves start as well. The so-called "manual" is only a one-sheet PDF that tersely says what each control does, but provides no real instruction. Much of the information in this article was compiled by trawling internet forums, user groups, and videos. The Volca can run off an AC to DC adapter, but one is not included. The Korg KA-350 Power Supply is an expensive accessory. Though it provides a conventional 9 V at 1700 mA, the connector is of an uncommon variety. Why Korg would do this is beyond me. One small change and you could use any conventional guitar foot-pedal adapter. But, no! Instead, you need to find a centre positive jack with 1.7 mm inner and 4 mm outer diameter. A company called MyVolts has stepped up to the plate with a single adapter that terminates in five cables, so you can run all your Volcas from a single supply. This is possible since each Volca has a current draw of 80 mA or less. So convenient! Though it's easy to skip over the missing "r" in the name, it's important to realise that this unit is not a sampler per se. There is no microphone or audio input, so you cannot directly record audio. The best way to get new sounds onto the Volca is to use the excellent free software from Frederikson Labs. Available for Mac OS or Windows, Vosyr is not only a sample manager but also a sequence editor. Simply drag audio files from your hard drive to the awaiting bays, then download these individually or in groups to the hardware. The way this works is quite amazing, since there's no digital connection on the Volca. Instead, the samples are encoded as sound, and sent through the sync jack. Now that's innovation! Samples can be mono or stereo, 16 bit, but sampled only at 31,250 Hz. In use this is not a big limitation, and imparts a certain "warmth" that some listeners might even find pleasant. To delete a sample, you need to boot your Volca in a dedicated mode. The protocol for doing so is outlined in a PDF file you should download from Korg. For those using iPads, there is AudioPocket, an iOS app for sample manipulation. C programmers can obtain the SDK from GitHub and start coding their own integration. Nice one, Korg! The Sample has a somewhat odd MIDI implementation. The 10 available samples in a sequence are assigned individually to MIDI channels 1 to 10. If you are controlling the Sample from an external MIDI device, it likely expects to send on one channel, and address samples with different MIDI note values. There are three ways around this quandary. The first is for controllers to implement the MIDI mapping the Sample expects. For example, Arturia went this route by providing a firmware update for their BeatStep Pro. So be sure you've updated that controller to firmware version 2. The second fix involves writing your own MIDI transforming utility, in a programme like Reaktor or Max. Perhaps that is beyond most readers. In any case, it only works if you want to be connected to a computer. The third option is to purchase the RK-002 "Smart MIDI cable" from Retrokits. This extraordinary cable deserves more explanation. It looks entirely generic, other than the tangerine plug ends. But it has a reprogrammable microprocessor hidden in the cable. A variety of firmware can be downloaded to the cable from your computer, making it function in one of several modes. One of these adds polyphony to the Elektron Digitakt, another increases parameter control over the Roland Boutique Synths. And one allows easier control of the Volca Sample, transforming MIDI note values sent on one MIDI channel into the encoding expected by the Volca Sample. The final limitation of the Sample is the lack of a MIDI output. This can also be solved if you don't mind taking apart your unit and doing some soldering. Korg have even helpfully provided labels on the circuit-board! Indeed, though the company doesn't officially support mods (which will invalidate your warranty, etc.) they do seem to unofficially encourage hacks. The adventurous can check out the post on Techies Expedition. 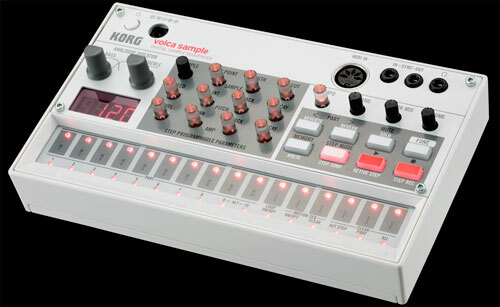 Similar mods had previously been made on the Volca Beats. While this has not been a formal review, I have tried to point out certain abilities and restrictions of the Korg Volca Sample. I am quite impressed that such a small box does so much. In the next article I will share some special tips and tricks!